Amesbury, MA. -- July 18th, 2018 -- Turner Motorsport is set to return to its home track of Lime Rock Park in the wake of recent success at Watkins Glen for round seven of the 2018 WeatherTech SportsCar Championship. The No. 96 BMW of Turner will return to racing action on the 1.51-mile 7-turn circuit in western Connecticut following the brief break since the start of the north east swing that has included three races in just over three weeks. Bill Auberlen, who has appeared in the Turner BMW for three races thus far this season will share driving duties with Robby Foley, who made his debut with the Turner team in June for the Chevrolet Grand Prix on the streets of Detroit. The duo teamed up together most recently at Canadian Tire Motorsport Park with a strong performance behind the wheel of the No. 96 LIQUI MOLY branded BMW. "It's great that I am able to team up with Bill (Auberlen) again after such a strong effort up at Canadian Tire Motorsport Park," commented Foley. "We had a solid car last race so I am really looking forward to continue to improve our platform and performance this weekend and hopefully walk away with some measurable results." Turner success at Lime Rock has been consistent over the past several years with recent class wins in ’06, ’09, ’10, ’15 and ’17 as well as a second-place podium in 2011 and third place GT podium in 2012. 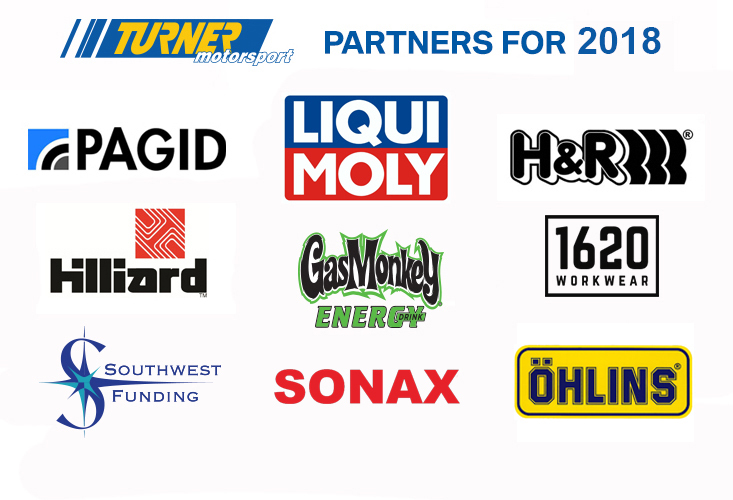 This weekend’s race will mark the Turner team’s 382nd professional race. In 2015, Michael Marsal and Dane Cameron captured a memorable GTD class victory in their BMW Z4. The win came only 24 hours after a crash in practice forced the team to work throughout the night to get the car race ready. In addition to on-track action at Lime Rock Park this weekend, Turner Motorsport will be hosting the Austin Hatcher Foundation Charity Auction at the Team transporter inside Big Bend at 12:30pm, Saturday July 21st. The Auction will feature various Turner Motorsport race memorabilia and hard to find gear like used body panels, driver suits, LIQUI MOLY product and more with all proceeds donated to benefit the foundation for pediatric cancer. To buy tickets to the race please visit limerock.com today. Ticket packages are available for both Friday and Saturday with special parking packages included. Turner Motorsport Taco T-shirts and other team apparel will be for sale at the track in the vendor area. Stop by to check out the latest blue and yellow team swag available. Practice for the IMSA WeatherTech Northeast Grand Prix begins at 12:05pm ET on Friday July 20th, with qualifying at 9:35am on July 21st. The Northeast Grand Prix will be televised nationwide on Fox Sports 1 at 4:00pm ET. Check your local cable listings for tune in details.